These are laid out in the diagram below. For disease to occur, you must first have a susceptible plant host. In this case, we’re talking about turfgrass. Next, you must have the environmental conditions that favor the disease development. 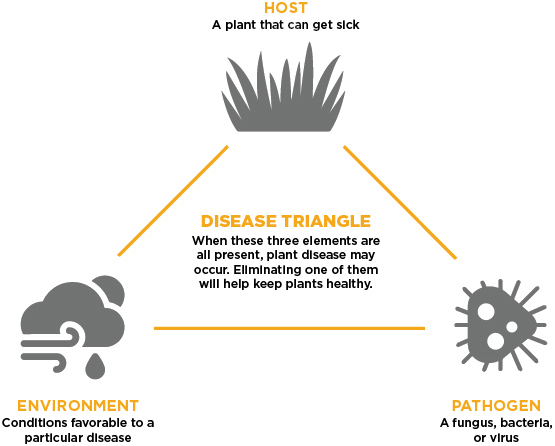 Finally, if the pathogen is present, you have all three elements of the disease triangle. This creates the conditions favoring development. Removing just one of these three elements can eliminate the possibility for the disease to occur. One of the most prevalent summer turfgrass diseases that impacts cool-season tall fescue lawns is Rhizoctonia solani, more commonly known as brown patch. Here is a quick checklist of items that can help you determine if your lawn may be susceptible to damage from brown patch. Brown patch pathogen favors tall fescue as a host, but can also be seen on other cool-season turf species such as perennial ryegrass and creeping bentgrass. Brown patch is considered a hot-weather disease, with development typically occurring during the summer months. Nighttime temperatures above 80 degrees coupled with leaf wetness periods of 10 hours or greater are ideal for brown patch development. To prevent extended leaf wetness periods, decrease irrigation run times during summer months. The pictures below illustrate the stages of brown patch development, from the fungus causing the disease to an infected lawn. In the above picture, mycelium (white thread-like structure) is the sign of the fungus that causes brown patch. Pictured above is a lawn infected with brown patch. The disease typically shows up as a circular patch, but can also have less defined margins, as seen in the front of the photograph. A preventative program, as opposed to a curative program, is always more effective and economic in keeping brown patch at bay. Whether you take the preventative approach or you are forced into a curative scenario, you’ll need the right product for the job. Prophesy provides multi-week residual disease control, coupled with strong economics, making it an ideal pillar for any summer disease program. Typical application rates for brown patch control are 2.5 lbs per 1000 sq. ft applied every 21-28 days. The patented dispersible granular carrier allows for the active ingredient, propiconazole, to quickly go to work on mitigating disease progression. 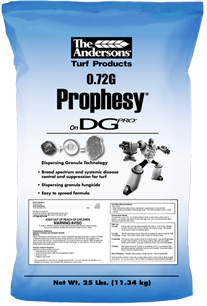 To download the label for Prophesy fungicide, use the button below.